Want to earn an easy 300 bucks? Do you know someone looking for a forklift? All you need to do is provide some basic details to us and we’ll do the rest. If your information results in a forklift sale or hire you get the money, it’s that simple! It may be a family member or friend, your boss or even your business partner looking for a forklift. Here at Southcoast Forklifts we’re not worried about how you know them only how we can help them. So if you have someone in mind that could do with a visit from us just give us a call on 1300 988 795. Spotters Reward Program terms and conditions. The Spotter is the person who provides sales leads to Southcoast Forklifts and will be referred to as The Spotter. The Lead is the business/person whom the Spotter provides information about to Southcoast Forklifts regarding the purchase/hire of forklifts and will be referred to as The Lead. Southcoast Forklifts will be the payer of the Spotters Reward and shall be known as SCF. 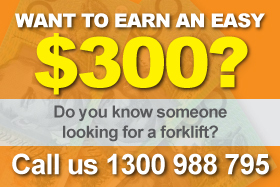 SCF will pay a Spotters Reward for quality leads that result in the sale or hire of a Forklift. Quality leads must include information about The Lead including; Trading name, contact name, telephone number, address and information relating to their forklift requirements. To Forklift sales that exceed $7,000 inc gst. To Forklift hire that exceeds six months in length. 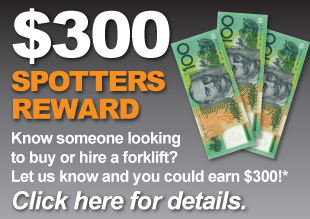 The Spotters Reward will be paid to The Spotter once the Forklift has been paid for in full in the case of a sale, or, the first months hire invoice has been paid in the case of a hire. The Lead provided by The Spotter must convert into a contracted sale/hire within thirty days of being provided to SCF to be eligible to receive the Spotters Reward. Once eligible the Spotters Reward will be paid by way of cheque or direct bank deposit as deemed by SCF management. The Spotter can request to have the Reward transferred to a credit for goods and services supplied by SCF. In the event of more than one Spotter providing the same Lead the Spotters Reward will be paid to the first Spotter, unless, subsequent Spotters provide better information as deemed by SCF management in which case the Spotters Reward will be divided equally between The Spotters. The Spotters Reward is eligible to Australian residents only. The Spotters Reward dollar value will be as advertised on SCF website. In the event that The Lead generates multiple sales/hire the first sale/hire will be subject the Spotters Reward, every unit thereafter will be eligible for a Spotters Reward payment of 50% of the advertised Reward. SCF reserves the right to alter, suspend, withhold, increase/decrease or cancel the Spotters Reward Program at any time and for any reason as deemed by SCF management. SCF managements’ decisions will be final and no correspondence will be entered into. These Terms shall be governed by the laws of Victoria and the parties agree to submit to the jurisdiction of the Courts of that state.